It has made my friends and family crazy sometimes when I only want to sit in the “back aisle” seat of a movie theatre. 1) Comfort – Since I am tall, I like the leg room and the easy access to get up without stumbling over people. 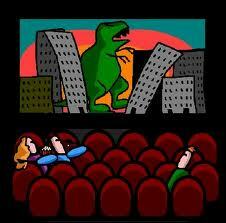 2) Uncomfortable – I’ve always been a tad uncomfortable in a movie theatre as it puts people in a vulnerable position. The awful gun tragedy in Aurora, Colorado surprised me but didn’t shock me as it has entered my mind before. I’m not saying that I would have survived had I been in that theatre, although my awareness of people and exits in crowded situations surely would have been a positive. If there is a silver lining to this horrific shooting, it’s that people should not only be more aware in a theatre, but more aware in general. Unfortunately, the complexity and danger in our global world has increased immensely in my lifetime. This fact demands that we keep awareness top of mind. One shouldn’t be paranoid or afraid to go places or not do those things they enjoy, although awareness must be a central part of our lifestyle. Look around and notice the actions of people. If you see something out of the ordinary, don’t be afraid to move away or report it whether it is an individual, group or suspicious bag. Despite my sound awareness, there was one time when I ignored my better judgement. Remember, the DC/Virginia Sniper in 2002 when the DC and Virginia areas were on high alert? I was on a business trip at that time, staying within 5-8 kilometres of some shootings. My boss and I went to a wide open golf range (my idea), which saw us in that unenviable “sitting duck” position for the sniper. A highway was nearby and we could have been the perfect target. We took the chance although it wasn’t a wise decision considering that we were in the heart of the shooting zone. It was a good lesson as I would never do that again. Before I met my wife, she exhibited great awareness when a fight broke out in a New York City movie theatre at the beginning of the film. She left right away as no situation like that is ever worth staying for. Awareness is a great strength as not only can it allow you to enjoy the precious moments of life, it can also help one anticipate or be ready for potential danger. Live to the fullest and maximize your fun, yet be cognizant of your surroundings. That awareness may save your life one day.